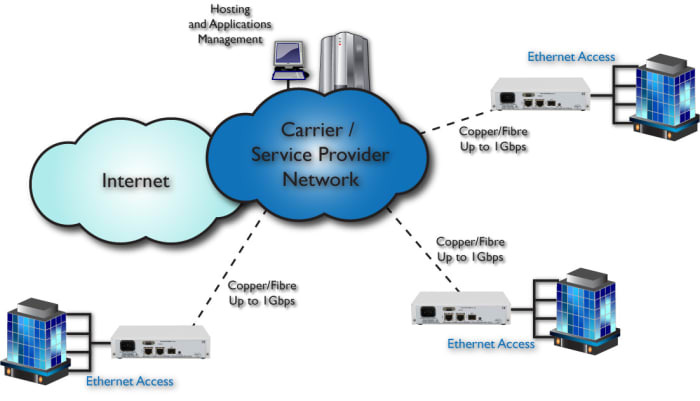 The FCM8000 EDD is a Carrier Ethernet Service delivery unit, offering end to end management using 802.3ah and 802.1ag OAM, delivering 10/100/1000baseT Ethernet services via copper or fibre infrastructures. The FCM8000 has been superceeded by our new Ethernet Demarcation Device range (also known as Network Interface Devices, or 'NIDs'): FCM9003 Ethernet Access Device, and the Advanced FCM9005 Ethernet Demarcation Device products, full details of which can be found under the Managed Carrier Ethernet Service Demarcation product menu. Zero Touch Provisioning (ZTP) fully automated discovery, installation and commissioning test process. The FCM8000 offers a sophisticated demarcation solution for Ethernet Service Providers, with flexible interface options. Measurement of the key parameters: delay and delay variation, is performed to ensure that the service is suitable for real time applications such as VoIP. These measurements can also be performed in-service against programmable thresholds to prove that the service continues to operate effectively over the longer term. This proactive fault detection assists in the rapid isolation of potential service problems resulting in high service levels whilst reducing operational costs (OPEX). The FCM8000 supports Zero Touch Provisioning (ZTP), minimising both on-site installation time and the Engineering skills required. This auto-provisioning process reduces on-site installation to a plug and play exercise, simple enough for the end user to perform themselves, i.e. simply checking that the Ethernet LEDs indicate correct physical connectivity. The EDD auto-discovers its management connection, IP address and TFTP server, then downloads its individual service definition parameters and management system contact details. The EDD then measures the delay of the service to milli-second resolution to prove that the service has been provisioned appropriately for real time applications. The EDD then auto-provisions itself and sends a service availability certificate to the NOC for inclusion into the Service Providers provisioning documentation. Subsequent in-service delay verification measurements then continue to check that service levels are being maintained and notify of any drop in performance below a set of programmable thresholds. The sophisticated commissioning process followed up with in-service continuity checking and delay monitoring combine to minimize the Total Cost of Ownership (TCO) of Ethernet Service Provision. The FCM8000 is available in a choice of 100-250 VAC or -48 VDC integrated power supplies, although a 12V-24V DC version is also available on request. The FCM8000 can easily be rack mounted in either a 1U two unit rack mount kit, a 6U eighteen unit rack mount kit. The FCM8000 can be deployed wherever managed service demarcation is required at the customer site. The FCM8000 supports standards compliant OAM functions and offers management visibility right up to the customer site demarcation point. 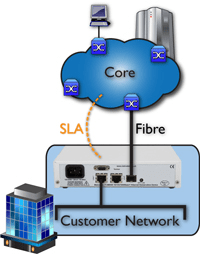 Both copper and fibre (SFP) network connections are offered. 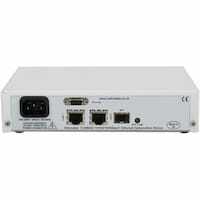 The FCM8000 can be used for the service demarcation of a wide variety of Carrier Ethernet services, including E-Line, E-Tree and E-LAN. Service separation can be achieved using VLANs, with prioritisation used to ensure that mixed traffic flows are handled appropriately. Continuous monitoring of service continuity and transmission delays underpin service integrity with the pro-active reporting of any significant service variations. 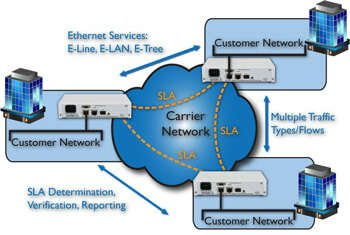 The majority of Ethernet Service Providers today are in fact Aggregators, offering end-to-end connections supplied on a wholesale basis, potentially sourced from a number of different Infrastructure Carriers. It is important for the Aggregator to ensure that their end-to-end service, right into the customer premises, has an acceptable delay profile for real time applications. In these deployments the FCM8000 can perform the necessary measurements whilst monitoring for any changes in performance levels below pre-defined thresholds. The FCM8000 has sophisticated and flexible Layer 2 Control Protocol policy management supporting either the filtering or pass-through of a wide variety of packet types including vendor proprietary L2CP frames. The FCM8000 supports auto MDI/MDIX cross-over switching on the copper interfaces, auto- negotiation and the transmission of 10k byte Jumbo frames. To ensure quick fault detection, the FCM8000 supports Link Loss Forwarding, whereby a network fault can automatically force a link down on the user ports to indicate to the attached devices that there is a link problem.